"And the life of Sarah was a hundred and seven and twenty years. These were the years of the life of Sarah. And Sarah died in Kiryat-arba (the same is Hebron), in the land of Canaan. And Abraham buried Sarah in the cave of the field of Machpelah before Mamre: the same is Hebron in the land of Canaan ." It's hard to imagine a scene as joyous and religiously charged as Machpela on the Friday night of Parshat Chayei Sarah. Every year, many thousands of Jews from all over Israel, and hundreds more from Europe and America, flock to the tomb of our patriarchs, which Abraham purchased for Sarah's burial nearly 4,000 years ago. The traditional burial plots of Adam and Eve, Abraham and Sarah, Isaac and Rebecca and Jacob and Leah are now enclosed within one of the region's only fully surviving Herodian structures, secure behind 6-inch-thick stone walls which have withstood countless sieges over the centuries. The property may have changed hands many times - from Romans to Muslims and Persians to Crusaders and Marmelukes - but on this night it belongs undeniably to the Jewish people. Until its recapture during the Six-Day War, the ruling Muslims only allowed Jewish pilgrims as far as the seventh step along an outer wall to stand and pray. On this night, the structure is filled to bursting point with hundreds of Jews of all denominations singing Lecha Dodi as one, with a fervor and passion that's simply unforgettable. Flashback to a previous visit: The heat and crush soon become too much to bear, so I squeeze myself through the throng to find a way out and finish Maariv in the coolness of the night air. Outside I encounter a heaving sea of humanity. During the past hour, every section of courtyard and grass verges has filled with hundreds of youngsters - yeshiva boys and seminary girls in separate sections - dancing to Lecha Dodi as if it were Simchat Torah all over again. It's a heartwarming scene of Jewish renaissance, oblivious to the hostile surroundings of bombed-out and battle-scarred Arab streets hidden in the shadows of a cold winter evening. As I peer across one of the dancing groups, a familiar figure catches my eye. With his trademark large black yarmulke and wispy white beard, the man stands back from the crowd, clutching a small siddur to his chest as he watches the excitement going on around him. Not a single one of those kids paid him the slightest attention. Why should they? How could they know that, without this man, none of this would be taking place? "Good Shabbos, Rav Moshe," I say. He returns my greeting with a handshake and a winning smile. Turning back to watch the youngsters dancing before us, I say: "See, Rav Moshe - these are kol bonayich [all your children]." It was in 1968 that a small ad appeared in an Israeli newspaper. It read: "Wanted: Families or singles interested in resettling the ancient city of Hebron. For details contact Rabbi M. Levinger." It was close to Pesach - the first Pesach after the Six-Day War - and this relatively unknown rabbi from Petach Tikva had the idea of holding a Seder in the newly liberated Hebron, final resting place of our patriarchs and first capital city of King David. War is always bad for business and the owner of Hebron's Park Hotel was only too pleased to welcome the 60 "Swiss tourists" who booked in for Passover. He allowed them to kosher-up the kitchens and provided for all their special festival needs. But at the conclusion of the Pesach week, Rabbi Levinger and his followers announced that they were refusing to leave. The police were called. The army was called. The government was called. They even sent the legendary defense minister Moshe Dayan to try and persuade them to leave. But Moshe the general was no match for Moshe the rabbi, and the standoff continued. In the end a compromise was finally reached. If he agreed to vacate the hotel, Rabbi Levinger and his followers would be allowed safe passage to move into an abandoned army base on a nearby hilltop. Forty years later, that hilltop has become the bustling town of Kiryat Arba, home to 7,000 Jews, complete with schools, synagogues and shopping centers. It is linked to Hebron and the Cave of Machpela by a short road, best known as The Worshippers' Way. 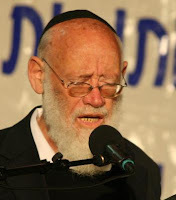 Thus Rabbi Moshe Levinger's 1968 Seder "sit-in" became the first settler foray into the liberated bible lands of Judea and Samaria, commonly known as the West Bank. Under the guidance of Rabbi Zvi Yehuda Kook, Rabbi Levinger later formed Gush Emunim (Bloc of the Faithful) which went on to establish dozens of Religious Zionist communities in Judea and Samaria which now boasts a Jewish population of more than a quarter of a million souls. During the year since my last visit, Rabbi Levinger suffered a stroke from which he has, thank God, been gradually recovering. I am flying out from England to be there again this year. While I may not find him in the crowd again this Friday night, Rav Moshe will not fail to hear the sounds of Jewish awakening echoing across the plains of ancient Mamre from wherever he is sitting. For just as Moses once led the Jewish people to their Promised Land, this modern-day Moses, with true grit and determination, has shown our people the way back home. I see they've resurrected the Saudi Peace plan. Or more accurately: the Saudi 'Piece' plan - whereby the state of Israel is reduced to the pieces of territory that the Arabs thought they could easily overrun in 1948. No-one with any basic understanding of the Arabs seriously recognises this as any kind of serious plan. Short of actually disarming the Jews, it is just one step away from leading another 6 million Jews to the slaughter, this time in their very own homeland. The Saudis have no control or influence over Iran, Hezbullah, the Palestinians and certainly not on Al Qaeda which is sworn to overthrow all the rulers, sheikhs and emirs of the region. So it has to be about the oil. And about the money too, as we see world leaders like Gordon Brown going cap-in-hand to the Saudis begging them to buy government bonds and major shareholdings in their stricken banks. Such Arab monopoly ownership of Western governments and financial centers may sound quite frightening right now. But remember, these guys have absolutely nothing but the oil that lies beneath their dunes. They have no science, no industry, no medicine, no agriculture. They are utterly and hopelessly dependent on the West and can't even pump out their own oil - let alone refine it - without outside assistance. So, they way the oil price is plunging, these guys will very soon be begging us to take back their T-bills and bank shares for a fraction of what they paid ..... in exchange for food.